... and Judy had her 'Bunny Love'. The photos are a bit dull because of the low lighting. It was great to be able to share the thrill of having your own quilt on display. Judy and I also spent some time volunteering on the Applique Guild table, it was nice getting to know some of the committee members and giving impromptu applique demonstrations. It's amazing how we can manage to keep track of what belongs to who. There was the usual Show and Tell so we could see what everyone had been working on. 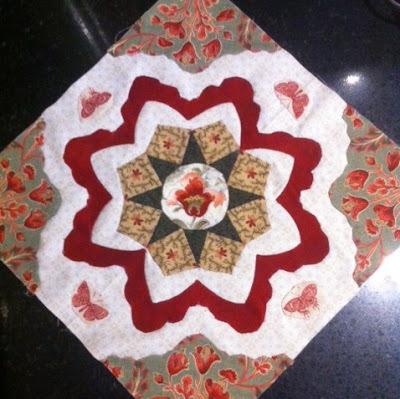 I had finished a block for Judy's quilt. 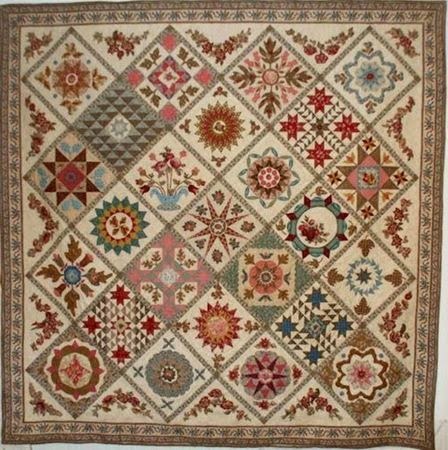 The block below is a special one designed by Judy which she based on one of the blocks from the original inspiration quilt. I wish it had been designed before I finished my quilt. Can you spot the original block? Judy and Sophie have been setting a cracking pace it and will be a close run thing as to who will be the next to finish. Then again, Lynne has just commenced some well deserved long service leave so who will it be???? Lynne's cute siticheries for a baby quilt. Our favourite thing is to help each other select fabrics for the next blocks. Sofie wants me to renovate her Block #5 as she no longer liked some of the fabric choices - this will be my homework. Then it was down to the business of actually sewing (wearing the G'nT uniform of flanellete pjs of course). This time we also watched the movie The Making of an American Quilt. This could be our new tradition watching a movie that includes quilts. Any suggestions? I'm thinking Stepmom or the The Descendants - George Clooney and a fabulous Hawaiian quilt, what more could you want?! 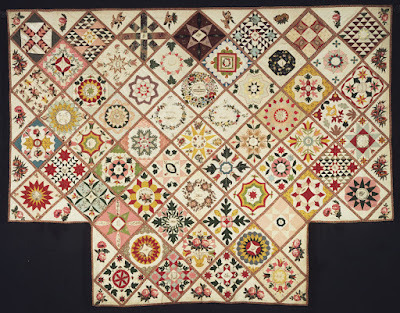 Congrats on having your lovely quilts shown in the show! All the blocks are so beautiful--so much inspiration--thanks for sharing them! 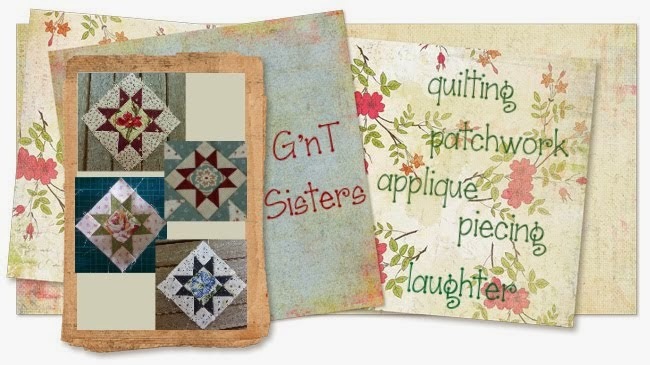 Use exciting to have your quilt ink the show, and very worthy! The appliqué you girls do is amazing. 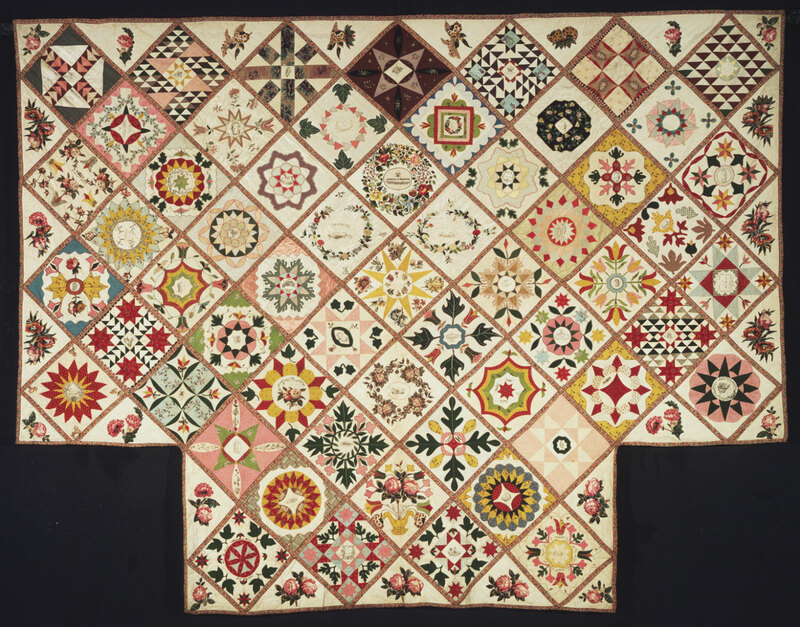 The quilts look wonderful hung. It is so nice to be able to get some distance from your quilt so that you can see the whole thing! Like the picture of you guys sewing in your jimjams while the cat is sprawled in front of the heater! We are sewing our own versions of Di Ford's Antique Wedding Sampler (Revisited). 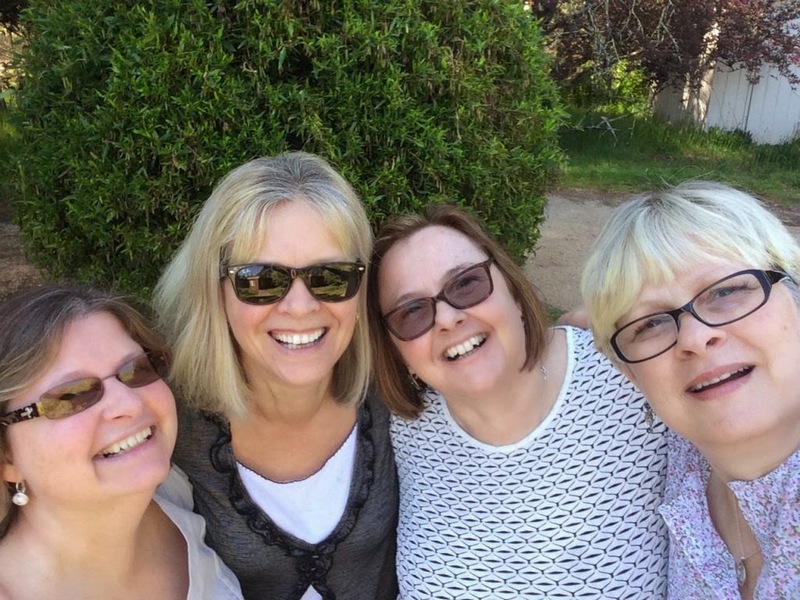 We try to get together once a month or so to help each other select (and buy!) fabrics, work on our blocks and laugh ourselves silly.